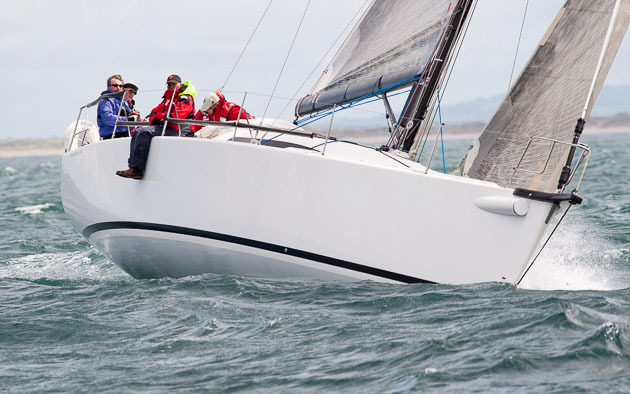 Excellent sailing competition is expected during Volvo Cork week 2014 with the news that the Irish Commodores’ Cup Team will be using this event to work up for their battle at the Commodores’ Cup in July 2014. This event was last won by the Irish Team in 2010 and there wasn’t an Irish entry in the 2012 event. Heading Team Ireland as Captain of the three-boat squad is seasoned campaigner Anthony O’Leary from the Royal Cork Yacht Club. He led the 2010 team to their first major Irish victory on the Solent and will participate with his Ker 39, Antix in the 2014 Commodores’ Cup. Currently sailing at the RORC Easter Challenge, Antix has been returned to her original 2010 configuration with a heavier bulb and I quote Anthony “she’s going fine now”. Marc Glincher’s Ker 40 Catapult, a boat recently sailed by Peter O’Leary in the U.S. and finishing third in IRC will join the team and making up the third member of the team is another flying machine Quokka. A Grand Soleil 43 she is being chartered by Michael Boyd and Niall Dowling from Peter Rutter and is a boat that has a reputation for staggering speed having achieved 22.1 knots in 24 knots of breeze. Also entered at Volvo Cork Week is George Sisk’s WOW a 42 foot Farr who needs no introduction to Cork week and is making a very welcome return. As already reported earlier, the flying Ker 40, Keronimo, a member of the winning British Red Team in 2012 will also be competing. This group alone will provide a mouth watering prospect of exciting racing and top class competition at Volvo Cork Week 2014.